03-Aug-2011 -- As I was in the area for the National Conference on Geographic Education, and as the conference focuses on fieldwork, scale, landscapes, population, human-environment interaction, and other core themes of geography, I felt compelled to visit a confluence during this year's annual conference. Furthermore, I had visited a confluence point during NCGE conferences in 2002 (New Jersey), 2003 (Utah), 2004 (Kansas), 2005 (Alabama), 2006 (Nevada), 2007 (Oklahoma), 2008 (Michigan), 2009 (Puerto Rico), and 2010 (Georgia), and did not like the idea of my streak of visits spanning multiple landscapes and multiple years coming to an end. Hence, a confluence visit while the conference was being held in Oregon seemed like the perfect fit. The main challenge was that this year, as NCGE president, my responsibilities would keep me at the conference site. My one and only window of opportunity came during the afternoon of the day when most of the participants were on NCGE-sponsored field trips. Having tagged the easiest confluence in the area, that on an on-ramp on Interstate Highway 5 in Salem during my February site visit to the conference site, I was now left with the second-easiest nearby point, 46 North 123 West. After making sure all of my duties for the conference that afternoon were completed, and after renting a car in downtown Portland, I was soon heading northwest out of the city on US Highway 30. Like the entire week, it was a grand and glorious day: Sun shining, temperature about 85 F, with marvelous views of Mt Hood behind me. But with a little delay getting the car and an appointment that evening to do some more work, namely, practicing for our upcoming plenary sessions, the overarching question was: Would I have enough time to achieve my goal? That seems to be a recurring theme in my 9 years of confluence narratives. Like nearly every confluence visit, this site was quite unexpected. I had thought it would be in a forest in low elevation, since I had not had time to check the maps in much detail before my trek. But soon after leaving the beautiful Columbia River valley at Tide Creek Road, it was evident that I would be in the hills. I encountered some wonderful vistas at Nicolai Road, which I would photographed on the return trip, but I was intent now to reach my goal. I passed the Goble Cemetery and then rose up even higher on Whitney Road. Not long afterwards, suddenly and abruptly at a picturesque ranch, the road became not much more than a trail. In fact, at the ranch itself was a trench dug across the road, with a warning cone. I passed it at barely a crawl and the road continued to worsen, and at times, I thought I would have to abandon the vehicle and start hiking. I finally did, with about 800 meters to the confluence point. After 15 minutes of steep hiking up, or west, on the road, I was within 100 meters of the confluence. I was at first very concerned that the site would be in the trees, which meant a loss of satellites and some difficult walking among the branches. It turned out to be in the clearing to the north of the road. It was not until I was on my way out of the area when I realized that the confluence had previously been in the trees for the simple reason that the site had been logged. 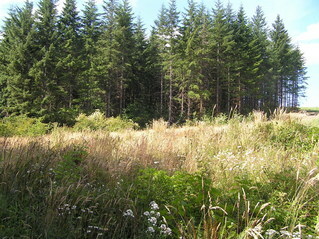 And not only the site, but huge swaths of land to the north of the road, which was obviously now a logging road. I filmed a few more movies on the way out documenting the extent of the logging. First, though, I needed to find the site, and it was a bit more difficult than I anticipated, even though it was in the clearing. When trees are cleared, it seemed like in this part of the world, the clearings are overtaken by very thorny vines. This made the 20 meter trek extremely slow, with uncertain footing, with me trying not to get my work clothing torn. Once at the site, I did my filming and spent a few minutes zeroing out the GPS unit. I also, thankfully, found a stump nearby where I could regain my footing. The confluence lies therefore about 20 meters north of the road, and north of the current forest. The clearest views were to the northeast, and due to the deforestation, allowed me to see nearly a mile in that direction. It was summertime in Oregon, a glorious time of year in a glorious landscape, and a beautiful site, despite the logging. The temperature was quite warm, bordering on hot, and there were very few clouds about. I saw no animals or people on my trip, not since leaving US 30 many miles earlier. This would be a wonderful site to return to, and given the logging here, it would be interesting to find out how long it would take for the trees to return. Or, would the area south of the road be logged first? I spent about 25 minutes at the site; a bit longer than I had expected, but kept my total time from the vehicle to under an hour. I took a few photographs on the way down but kept going as rapidly as I could all the way back to downtown Portland. It was indeed an excellent way to supplement the week of geography education, and I kept my streak of confluence visits at this conference alive! #1: The confluence of 46 North 123 West is in the thorns on the left side of this view, looking northwest. #2: Thorny and dense groundcover at the confluence point. #3: View to the west from the confluence site. #4: View to the east from the confluence site. #5: View to the south from the confluence site. #6: View to the north from the confluence site. #7: Sky view from the confluence site. #8: GPS reading at the confluence point. #9: Joseph Kerski at the confluence of 46 North Latitude, 123 West Longitude. #10: 360-degree panoramic movie with sound filmed at the confluence site (MPG format).